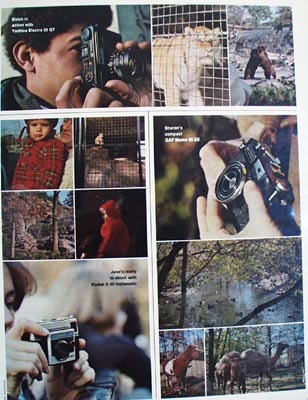 Kodak Two Pages of Pictures Ad 1972 This is a February 1972 advertisement. It is a nice two page ad from Kodak. It shows Eldon in action with Yashica Electro 35 Gt and the pictures he has taken, Sharon's compact GAF Memo 35 EE and her pictures, Jane's ready to shoot Kodak X-30 Instamatic and her pictures, Jonathan sets Kodak X-45 Instamatic and his pictures and David's' Polaroid Big Shot and his pictures. In excellent condition. Photo is taken through plastic and may show wrinkles or crookedness that is not in the ad. This magazine tear sheet measures 10"" wide by 13"" tall. 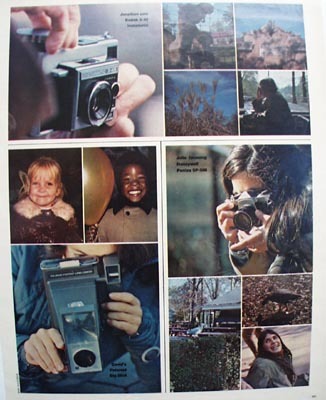 Items Similar To "Kodak Two Pages of Pictures Ad 1972"
Kodak Drop in Movies 1970 Ad.